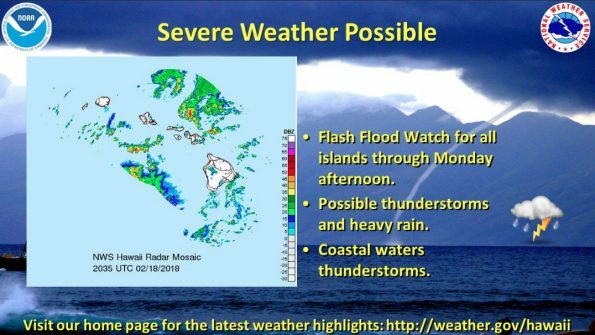 A Flash Flood Watch continues for all Hawaiian Islands through Monday afternoon (Feb 19). Abundant low-level moisture will combine with a strong disturbance aloft to bring widespread heavy rain and thunderstorms. Rapidly developing and slow-moving heavy showers and thunderstorms will continue to impact both windward and leeward areas. Many areas are already saturated, and any additional rainfall will quickly lead to flash flooding. The National Weather Service in Honolulu has issued a Winter Weather Advisory for Hawaii Island summits over 10,500 feet until 6 p.m. Monday (Feb 19). Abundant low to mid level moisture will remain over Hawaii Island through the holiday weekend. As a strong upper level trough moves overhead today and tonight, moderate to heavy snow showers and thunderstorms will likely develop. Snow is expected on the summits. Plan on hazardous road conditions making travel to the summits dangerous. Snow accumulations of 2-4 inches, with localized amounts up to 6 inches, are expected. Be prepared for reduced visibilities at times. Heavy bursts of snow could also be accompanied by lightning. A Winter Weather Advisory for snow means periods of snow will cause travel difficulties. Be prepared for snow-covered roads and limited visibilities, and use extreme caution while driving. 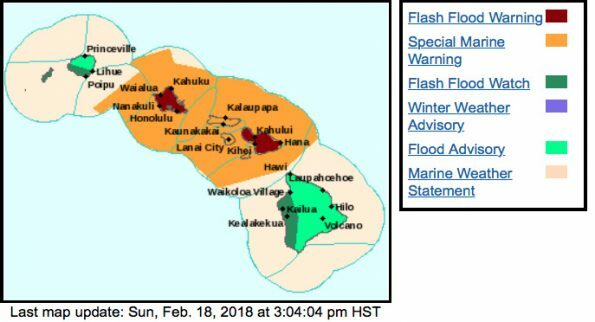 The National Weather Service in Honolulu has issued a Special Marine Warning until 5 p.m. Sunday (Feb 18). At 3:03 p.m., several clusters of strong thunderstorms were located over a large portion of the central coastal waters from Oahu to east of Maui. Storms were showing erratic movement, and are producing numerous dangerous lightning strikes and wind gusts in excess of 30 knots. Small craft could be damaged in briefly higher winds and suddenly higher waves. Locations impacted include waters around Oahu, Molokai, Lanai, Maui, Kahoolawe, Hawaii Island windward waters. Boaters should seek safe harbor immediately until these storms pass. Wind gusts 34 knots or greater, high waves, dangerous lightning, heavy rain and waterspouts are possible with these storms. Strong thunderstorms over the coastal waters will produce prolific amounts of dangerous cloud to surface lightning strikes, strong winds gusts near 30 knots, as well as isolated waterspouts. For Hawaii Island this includes the Alenuihaha Channel, windward, leeward and southeast waters. Boaters should consider postponing plans to head out to sea until weather conditions improve, or return to port. If you must head out to sea, be prepared to take quick evasive action if a warning is issued.